to shop ‘til you drop, to eat a little more than usual and spend time with loved ones. Personally, I look forward to the holiday season all year. I just can’t get enough of it, the décor, the baking, the quality time with family (pets included!) and friends, it truly is magical. Despite all of the splendor, the holiday season can also be one of the most wasteful times of year. 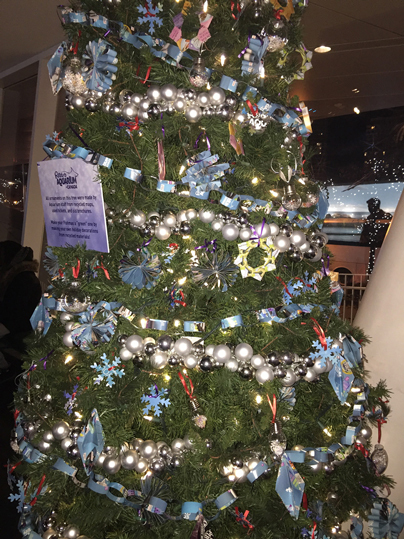 Take a moment to think about all of the waste produced over the holidays: food, wrapping paper, ribbon, bows, cards, the list goes on and on. If you’re looking for small ways to ensure your holiday is a green one you have come to the right place! Let’s start with the lighting shall we? In this case, LED is better, or at least more efficient and cheaper. LED lights consume 95% less energy than their incandescent counterparts. On top of that, the lifespan of an LED light is almost 10 times longer, way more bang for your buck if you ask me. Christmas can already be expensive enough, and this hack is a great way to cut costs! Better still, why not have the sun pay your lighting bill for you?! This is easy to achieve by visiting your local hardware store and investing in solar powered outdoor Christmas lights (yes, those exist!). While we’re on the topic of lights, did you know many people accidently leave their holiday lights on long after they have retired for the night. Now is also a great time to think about investing in a light timer! By having lights on an automatic timer you can toss the responsibility of remembering to turn them off out the window! Let’s move on and discuss my personal favourite part of the holidays, the tree. For as long as I can recall getting the tree has been the best part of the holidays. My family would load up our dogs and trek out to the farm to find that perfect tree to decorate. You may be in for a shock if you think artificial trees are the way to go green, it’s actually live trees that are the more sustainable option. Being a petroleum-based plastic product, artificial trees last forever, that’s true. However, after a few holiday seasons they start to show a little wear and tear and are relegated to landfills shortly thereafter. Live trees, as we all know, do wonders for our air quality during the growth process and are grown on specific tree farms where they get re-planted on a regular basis. By selecting a locally grown, live tree you are also not contributing to the carbon emissions that come from shipping over long distances. Moving on to the act of gift-giving now, why not try to opt for battery-free gifts? About 40% of annual battery purchases occur over the holidays, and batteries (rechargeable or not) can be an environmental hazard if not disposed of properly. If you do choose battery powered gifts, be sure used batteries are dropped off at designated battery disposal sites after use. When wrapping those thoughtful presents, there are so many options! Between ribbons, wrapping paper, bows and tags, there are so many ways to spruce up their appearance. Did you know, in Canada, the annual waste produced from gift wrap and shopping bags is close to 54, 500 tonnes? To put that into perspective, consider this: a blue whale (the largest mammal on earth) weighs a mere 200 tonnes in comparison. You can minimize your waste contribution by wrapping gifts in cloth bags, giving new life (as gift wrap!) to old calendars, maps or comic strips or by recycling gift wrap from year to year. 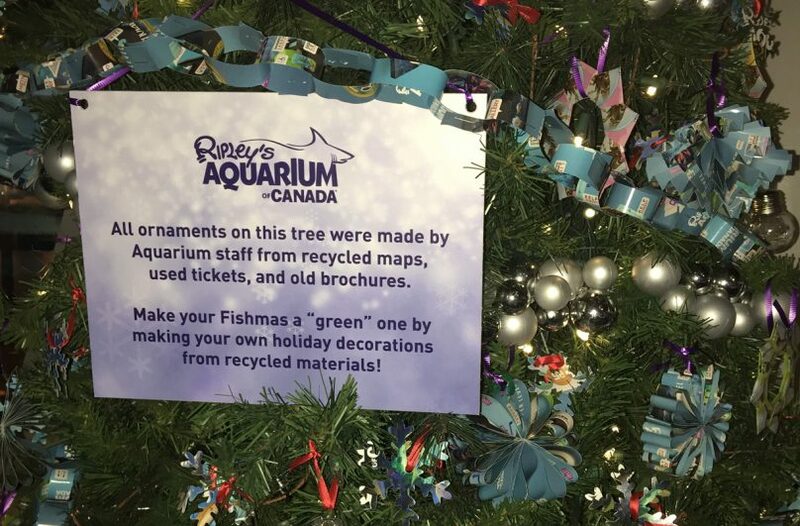 Here at the aquarium we make tree ornaments from recycled maps and tickets. Another great hack (which, admittedly I just learned about) is to cut the front of last year’s holiday cards off and re-vamp them into this year’s gift tags! My final suggestion is something we all probably do far too infrequently. Defrost your freezer! Not only will this make it more energy efficient, it also means you have more room for all those delicious holiday leftovers. There you have it, some quick and easy ways to join me in making this year’s holiday season a green one! I’m sure you all have other ways to help. Why not share them below? Katelyn has been a member of the education staff at Ripley’s Aquarium of Canada for over three years. She graduated from the University of Guelph with a Bachelor of Science degree in Marine and Freshwater Biology, minoring in Environmental Resource Management. She then continued her studies at the University of British Columbia where she studied the physiology of fishes and received a Master of Science degree in Zoology.